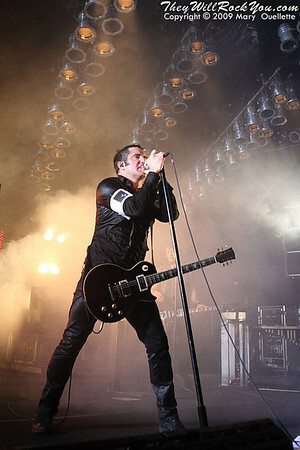 Nine Inch Nails : TheyWilllRockYou.com – For the love of music! Serving Boston and Greater New England. It’s a good day to be a Nine Inch Nails fan. Over the past 24 hours NIN shared a new song called “Came Back Haunted”, announced plans for their new disc Hesitation Marks due out on September 3, and confirmed a monster run of tour dates. Listen to the new song below and check out the tour dates to find out when Trent and company will be swinging through your hood. Our video of the week is the new song “Remission of Guilt” from The New Regime. The New Regime is the new solo project of Nine Inch Nails drummer (and formerly LostProphets) Ilan Rubin. Rubin wrote and recorded all of the bass, drums, guitar, piano and vocals on The New Regime’s 2008 debut, Coup. Currently working on his second album, he’s offering fans a free download of “Remission of Guilt” just for heading to his website and entering your email address here. About “Remission of Guilt,” Ilan says: “I came up with the initial idea for this song at about the halfway point of completing the second album. Since I had a precise vision as to what I wanted the album to be, I finished the idea for this song and recorded it almost immediately after the album was done. ‘Remission of Guilt’ is probably the most aggressive of all the TNR material to date but still retains the clarity of melody, the detail of harmony and structure, and the execution of musicianship.” While the track is not included on the new album, it is a good preview of what’s to come. Acdording to NIN.com Reznor and Co. are going to be playing a “handful” of shows in NYC, Chicago and LA starting August 22nd. The shows will be in medium/small venues and will offer up longer set lists and special guests. For all the details check out www.nin.com. The dates are not posted but many venues in NYC, LA and Chicago are mentioned. Sorry Boston, no love just yet.